My wife and I spent a couple days in York, England recently. 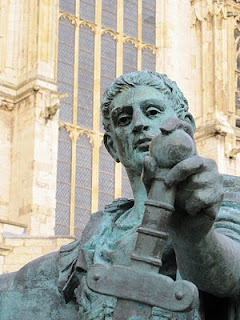 While there we saw a statue to Constantine erected just beside the main cathedral in the area--the York Minster. While beautiful and impressive in many ways, we were reminded by the cathedral of how far from the original intent of the church people had taken her. The early church was organic and a movement for the first couple hundred years. Driven underground by waves of Roman persecution, it remained a viral movement that could not be contained or stopped. Though many tried to stomp it out all attempts only made it stronger. All that changed in 313 AD when the emperor Constantine declared that the empire would not only tolerate Christianity but restore to the church all lost property. He was the first “Christian” emperor and Christianity went instantly from the margins to the mainstream and everything changed. Christianity became the state religion and the church did not change much from that point on. Our enemy, the devil himself, learned that if he cannot stop the church, he might as well join it and change it from the inside so that it is ineffective and less a threat. But for occasional breakouts of remnant expressions he succeeded. He used Constantine to launch this sinister attack. Over the centuries, after Constantine, the Western church has evolved in many ways, but none have been a significant systemic change. There was the establishment of both the Roman Catholic Church and the Eastern Orthodoxed Church and for hundreds of years there were very little changes. The Reformation split the Western church into the Roman Church and the volatile protestant church. But as an institution, in spite of the differences, the institutional system remained mostly unchanged. The Anabaptists were set lose by the reformation (and persecuted by it) but quickly would institutionalize as well. Whether the church adapts to reach coal miners in the 18th century England or postmodern pilgrims in the 21st century, most of the changes have been minor shifts. Whether you are talking about high church or low, Pentecostal or Presbyterian the church has remained institutional in its approach. From Baptist to Brethren, from Mennonite to Methodist, the changes in the system are relatively untouched over the centuries. Music or no music? Pipe organ or electric guitar? Tall ceilings with stained-glass widows or meeting in a box building without windows, the actual system of church has gone relatively unchanged. You have the priests or pastors, the Sunday service with singing and a sermon, the weekly offering, the pulpit with pews and the church building. These have been constants since the forth century. Even if you move the whole show into a house instead of a church building, if the system hasn’t changed you have only shrunk the church, not transformed it. Changing the style of music does not upgrade the system. Turning down the lights and turning up the volume is a simple patch to the same old system. Choirs and hymns or praise bands and fog machines, kneeling or standing the system is changed very little. Sermonizing with topical messages or expositional ones is not changing the system just making minor adjustments. Sunday Schools or small groups as secondary learning environments are not a systemic change at all, just a variation on the same old operational system. Constantine was declared Caesar while in York in 306 AD. Today, near the spot where he was named the emperor is a statue of him beside a large cathedral, which I find quite symbolic. Constantine turned the church into an institution and in that state it remained for for 1700 years. He is now remembered beside a very institutional expression of what church is--the York Minster Cathedral. Today we are seeing a rapid shift back to organic and viral expressions of ecclesiology. We should remember Constantine so as not to make the same mistake. We must begin to awaken once again to the true nature and expression of Christ's body, not as a building, a program, an event or an organization, but as a spiritual family called out on mission together. We must come to realize once again that the form of church is not the issue, but the way we relate--to God, one another and the world. A relationship should not be defined by a calendar appointment, a task to complete, or a roster in an organization. Relationships should transcend all of these things. Compare your relationship with your spouse, parent or child to such minuscule things and you will see that these connection points do not make a family but simply acquaintances or fellow members of a group...not familial at all. The core of relationship is devotion to one another. The fulfillment of God's entire law is to love one another. This is a commitment to each other in the face of anything and everything. If simply not maintaining an ongoing meeting is enough to sever the relationship it was not a true relationship built on love, but on convenience. Welcome to Christianity in the world today, a faith of consumerism and convenience. I look forward to my buddies (Hirsch and Frost) release of their book on liminal experience called The Faith of Leap (April 2011) which I believe with help us understand how relationships are affected by missional experience. You see, when a relationship is tested in an adverse situation where we need to come through for each other, it becomes real, deep and lasting. If it cannot even endure the cancellation of a regular meeting it is not a relationship of depth in any degree. We no longer bring our relationships into environments where we simply must depend on each other for survival. Instead we limit what our relationships are to easily managed but not very deep activities that do not develop beyond the level of acquaintance. Ironically, the very thing that can forge a true, deep and lasting relationship--mission--is feared because it is seen as a threat to our weak but convenient relationships. It is when we take our relationships into mission that they become stronger, not weaker. By avoiding mission under the pretext that regular meetings are necessary to maintain a relationship then we do not have relationships worth maintaining in the first place. When the flaming missiles whiz past your ears and your brother or sister is the one watching your back as you watch theirs, you become connected in the depth of your soul. You need each other, and when you are there for one another the relationship becomes deep and lasting. As you sacrifice for each other's success, you have learned what love truly is. The young men who stormed the beaches of Normandy under a barrage of bullets, and who lost many comrades, have come to know a deep relationship with brothers that endures a lifetime. They may not see each other every day, every week, or even every year, but still many keep connected more than 66 years later. Their lives are tied together, not by convenience but by a deeper experience that transcends meetings, tasks or membership. When you know that you are alive today because of this other person's sacrifice, you value the relationship at the depth of your being. If you cannot even maintain a relationship after a regular meeting has ended then the relationship was not much. Convenience is not the foundation of the Christian faith. Love is. Love is not always convenient, but it is always true and faithful and for the benefit of others. It has recently dawned on me that we really have no idea whatsoever what living in true community is. Perhaps the most telling symptom is found in the response so many of us receive when we speak of multiplying groups. It is quite common that people do not want to reproduce a group because they value the relationships they currently have and are afraid that if they start a new group they will lose the relationship. A recent review of Search & Rescue even mentioned that Life Transformation Groups foster short term relationships because they are to multiply frequently and discipleship must involve much longer relationships than LTGs promote. Well, this is actually a glaring symptom of a much more serious issue: we do not have very good relationships! If our relationships cannot endure maturation and development over the years then they are weak and anemic. For centuries church has been mostly defined by meetings. As a result we have settled into a superficial understanding of how we relate to one another that is completely limited to scheduled meetings together. The result is that we think if the weekly meeting changes the relationship is lost. This, my friends, is shallow and sick. A relationship is so much more than seeing one another at a weekly event. Church is so much more as well. I believe that church is to be a spiritual family on mission together, not a weekly meeting or religious event. We actually believe that when we send people out to start meeting in another group that we have lost or severely hurt the original relationships. Really? Is your relationship simply about meeting for a once a week Bible study, worship service or potluck? We must have stronger "ties that bind" than these. Once we begin to see church as a family instead of a religious meeting everything changes. We are no longer restricted to a two hour scheduled meeting. Family is 24/7. Even when a child grows up and moves away they are still part of the family and thought of with affection and belonging, right? Of course. They will be missed and there may be more expensive phone bills, but the relationship is still strong and in tact. To be honest, when I look at old photos of my children as toddlers I miss them in that stage, but I am so glad I get to know them in all the stages of life. I look forward to the thrill of grandchildren, and I would never know this thrill if I somehow kept my own kids from maturing. And if children mature and become parents themselves, the family is stronger for it, not weaker. The fact that we are so concerned with a church giving birth to another indicates that we really do not understand church naturally--as a family. Imagine if you actually treated your own family they way we practice church. What would your family be like if you only saw each other once a week, seated in rows, with one person doing all the talking and another collecting the weekly offering. Then you sing a song and depart for the week not to see each other until the following meeting. That is not a strong family at all, nor is it a strong church. I maintain strong relationships with people that have moved on to start new groups and reach new people. Our relationship matures over the years but doesn't diminish. We may begin to know each other in a Life Transformation Group, but when the group multiplies into two other groups our relationship has ended! No, in fact most of the time it matures into something better, not worse. I think that the reason people cling to a group meeting with such desperation is because it is the closest thing to relationships in church that they have every known, which is quite sad when you think of it. We simply must develop stronger relationships that are not threatened by the thought of naturally birthing new generations. If in your own family you stuck together and never matured or allowed your children to grow into independent adults and parents themselves you would have an extremely unhealthy family. Grandchildren do not weaken familial ties, they tend to strengthen the family in almost every way. Grow up church! Become the family you are meant to be. Celebrate the birth of the next generation and enjoy your grand kids! If you are too afraid to do it you will miss out on the best part of family.